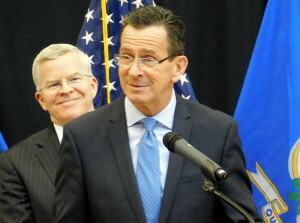 Hartford-Governor Malloy announced today at the State Armory that Connecticut has ended homelessness among the state’s veteran population. “Today’s confirmation of Connecticut’s success in ending veteran homelessness is a tremendous and positive step forward in our efforts under the Zero: 2016 Initiative,” said Zero: 2016 co-leads Alicia Woodsby, Executive Director of the Partnership for Strong Communities, and Lisa Tepper Bates, Executive Director of the Connecticut Coalition to End Homelessness. The Zero: 2016 initiative is part of a national effort to end veteran homelessness and chronic homelessness, the long-term homelessness of people living with disabilities, by the end of 2016. Connecticut is one of only four states accepted into the effort through its Reaching Home Campaign, the statewide campaign for preventing and ending homelessness in Connecticut. The VA Connecticut Healthcare System, the VA’s Supportive Services for Veterans Families programs, Department of Housing and Urban Development, the state Departments of Housing and Veterans Affairs, CT Heroes Project, nonprofit providers of homeless services across the state, and the co-leads of Zero: 2016 worked together through the Reaching Home Campaign to meet the goal of ending veteran homelessness. “With Governor Malloy’s extraordinary vision and leadership, and through a highly effective team effort, there’s been an incredible level of collaboration to identify and house veterans experiencing homelessness,” said Woodsby. Connecticut has housed 766 veterans in the last year to reach this milestone. Through extensive efforts to identify and reach out to veterans experiencing homelessness, and expedite the path for each one to appropriate housing, Connecticut has ensured that veterans are able to move from homeless to housed in under 80 days. “Every veteran who has moved from homeless to housed is an important victory,” Bates said. “At the same time, a critically important part of the achievement is building a system capable of identifying, sheltering, and housing every veteran in need quickly – now and in the future.” Federal, state, and nonprofit partners will work together to maintain this system to serve future veterans facing episodes of homelessness. “This accomplishment is an important milestone that shows what can be done through great teamwork, smart investments, and careful use of resources” said Woodsby. Now that Connecticut has addressed Veteran homelessness, we are heightening our focus on ending chronic homelessness. National studies show that the chronically homeless population is the highest need segment of those experiencing homelessness, and tend to cycle in an out of expensive public systems like emergency services, hospitals, and jails. National studies show that ending chronic homelessness can save communities 70% of these costs.